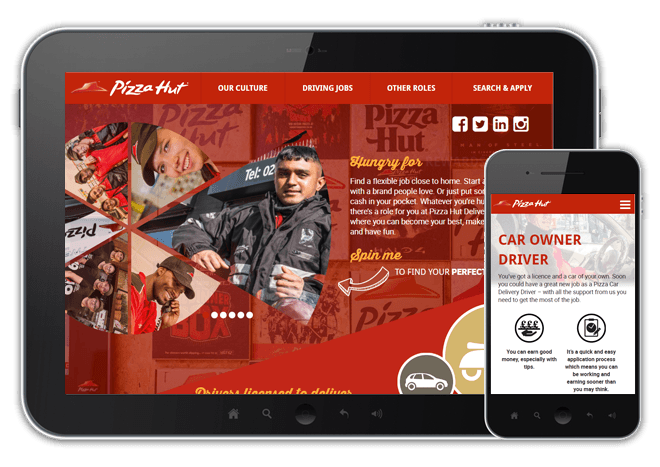 Designworks worked with London based recruitment marketing agency, WDAD Communications, to deliver the Pizza Hut Delivery Careers’ website. The project was completed in two phases. Phase one was the job search, this had a successful soft launch in Yorkshire followed by a nationwide launch. Phase two was the design and build of the careers website. Both phases use WordPress as a Content Management System. The first phase job search functionality integrates with a mapping system. Through mobile GPS the system identifies a user’s location and displays jobs within a selected radius. On desktop devices users are prompted to insert their postcode. The map data comes from a third party source and the information is integrated into the map. The second phase was the design and development of a bespoke, responsive WordPress website. The website concept uses pizza slice shapes to create a navigational spinning pizza wheel and an angular web page design to separate content. Finding a suitable solution for both elements was a challenge but it really sets the website apart and gives it a unique look. Video is used throughout the site to engage with the target audience.